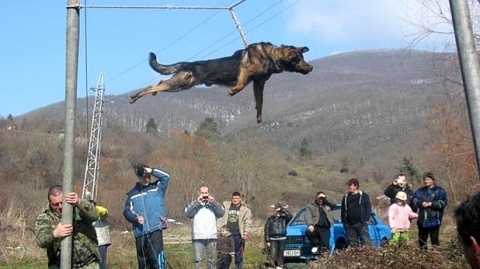 The ancient ritual known as "dog spinning" to ward off evil spirits has reappeared in a small town in Bulgaria. Dog spinning or "trichane" is a ritual performed once a year on March 6 to prevent rabies in a village and keep away the bad spirits of springtime. The dogs are panicked and scared - shocked. 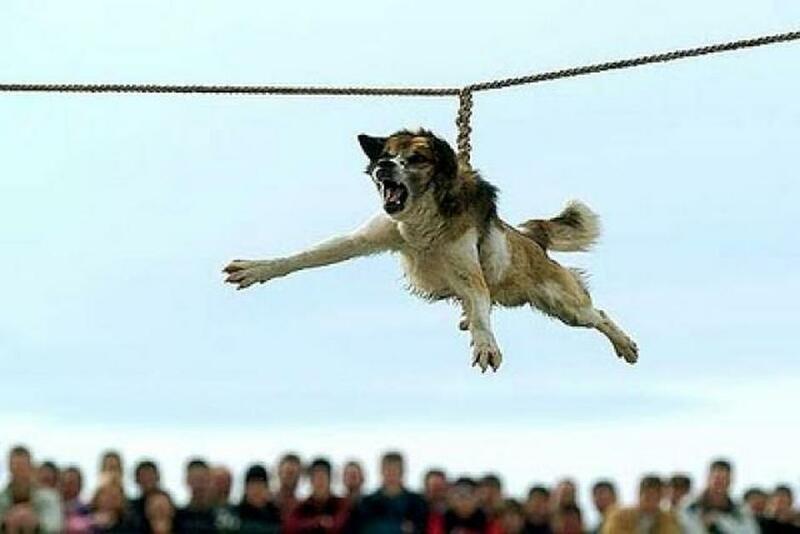 The rope cuts into the armpits and chest and hurts with difficulty breathing. After the spin, the dogs falls into a cold creek and since the dogs are disoriented after the rapid and intense spin, they both swallow and breathe in the cold and dirty water. Previously, dogs have drowned. 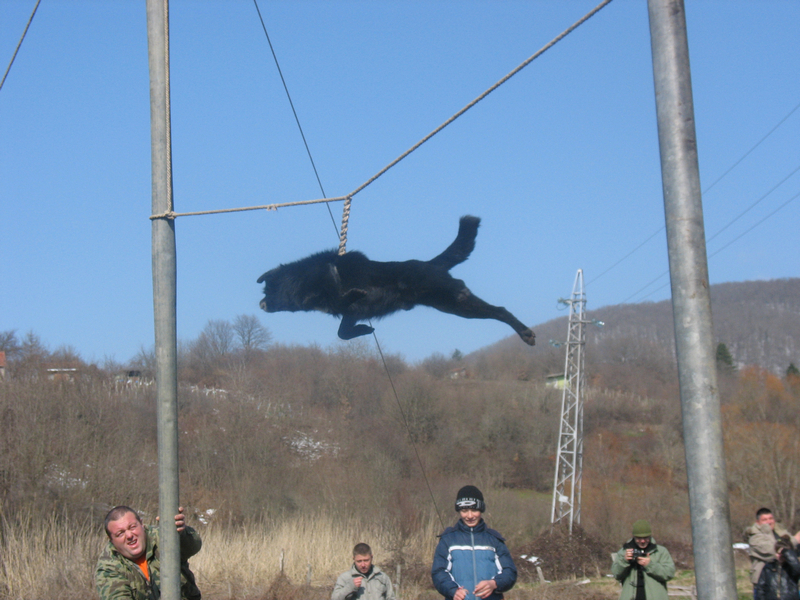 Animal rights activists have managed to thwart a bizarre traditional that involves spinning dogs on a rope above a river in rural Bulgaria to ward off rabies. For hundreds of years, locals in the remote town of Brodilovo in the south-east of the country have carried out the annual Spring ritual. It involves twisting dogs a rope stretched out over a river until it is taut and then threading a dog through a noose at its end. The local residents then let the animal go and it spins out of control until it tumbles into the water below. The terrified dogs reach such high speeds that by the time they land in the river they are unable to swim. 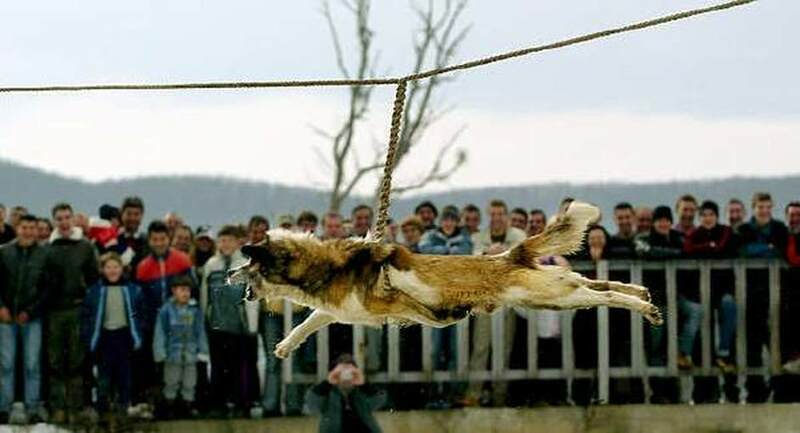 But the pagan tradition - banned by law in 2006, still carried out - was thwarted this year after animal rights activists mounted a campaign to expose the cruelty. Members of Animal Rights Sofia guarded the banks of the Veleka River last weekend (25-26 February 2012) to make sure locals kept to the new guidelines. Under these, the dogs are simply thrown into the water and can swim to safety on the other side. A spokesman for the town's mayor Petko Arnaoudov said: 'It is not ideal, but it is better than it was. 'Some of these traditions have taken root over hundreds of years. You don't change them overnight - You cannot stop a traditional custom with a simple order. An annual tradition where the audience laughs at dogs despair is just a superstitious entertainment hocus pocus - animal cruelty.